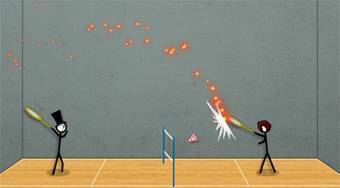 Do you like Stick Figure Badminton 3? Share it with your friends. Stick Figure Badminton 3 is the third continuation of a very successful sports flash game where you play stickmans popular badminton. You can play the game either against the computer or against your friend on one computer. Choose one of the available players and then play. The winner is the player who first gets seven points.